This book explores the politics of feminist knowledge transfer, offering a critical reflection on the practice of gender expertise and gender training. 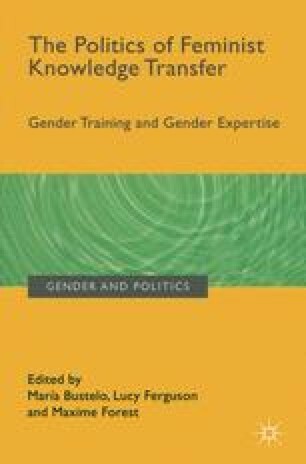 It brings together analytical and theoretical work on feminist knowledge transfer with revealing experiences grounded in the practice of gender training and gender expertise. These processes are explored in a reflective and analytical way, bringing what has up to now been primarily a practice-based debate into the academic arena. Overall, the book aims to critically reflect on the politics of feminist knowledge transfer and the relationship between gender expertise, gender training, and broader processes of feminist transformation.